If you are an entrepreneur or have the wish to be, it is very likely you have heard about Robert Kiyosaki, who became famous for his book Rich Dad Poor Dad. It is a book that has inspired millions of people all over the world to think differently about money and how to build an income. That was also why I was excited, when I a while ago saw there was a free 2-hour official Rich Dad Education workshop in the city I live in. However, it turned out very differently than expected. In this Rich Dad Free Seminar Review I will share my experiences about what happened at the workshop with you, and I hope it might help you better understand what to expect, so you will be prepared, before you go. Personally, I would wish I had this information before I went, and I would probably not have gone, if I had known this. But let me explain what my experiences are, and then you can decide for yourself, but the at least you will be prepared, if you go. First I want to emphasize that this review is based on my experience and opinion – there will probably be other experiences and people that feel better about it than me. 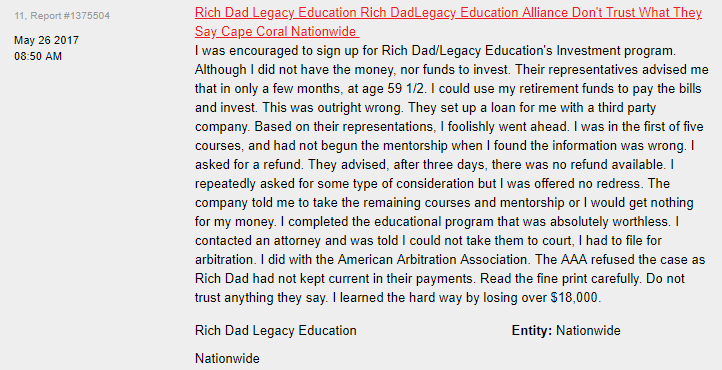 The background for writing this review is that I feel it is important to know the tactics that in my opinion are used at these Rich Dad education workshops. They take place all over the world every week, so it is very likely you have also seen them advertised in a city near you. In my case, I saw a Facebook ad about a free 2-hour Rich Dad Education workshop only a few kilometers from were I lived at that time. It is always interesting to hear inspiring ideas about how to build a business, and whether you are an online entrepreneur or just interested in finding a way to build an income or another way to think about money, you have very likely heard about Robert Kiyosaki and his books. When I saw there was a workshop in his name, I automatically trusted that it would be inspiring and something I could trust – that was my first mistake. 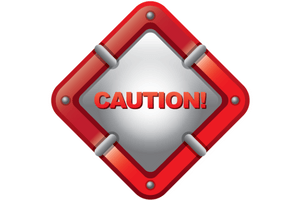 At the time I had not yet worked so much with my online business, but I had worked enough to know there are a lot of scams, and was already at that time good at recognizing when I had to be careful. In this case I was caught completely off guard, because it was in the name of Kiyosaki. So I decided to go. Since it was a free seminar, I was of course aware there would be some selling going on, but I expected it would be books etc. with focus on giving some good and inspiring information. What actually happened at the event was very unexpected. What is the Rich Dad free workshop/seminar? Of course a free seminar like this will try to sell you something, but this seminar took things to a new level in relation to what I have experienced before. It was a 2 hour long very well planned, and very clever sales pitch. I even felt like I had been brain washed after, and was almost not aware of what had happened, even though I am usually so aware of such things. If you know anything about the psychology of manipulation and of getting people to say yes without thinking, these guys were masters of this in my opinion. First of all, Robert Kiyosaki was not present himself, which they also clearly tell, before you go to the event, so I was aware of this. I did however expect that there would be someone who could give a lot of inspiration. But the guys there had a very clever and very well planned show that was only designed to get you to buy a 3-day seminar. There was a few interesting points made there, but it was all a big selling show. But in a way were you did not necessarily notice it that much, because it was also entertaining and action were people were running to get free gifts etc. I am not proud to admit it, but I actually did end up buying a 3-day seminar, as I thought it would be useful inspiration to get. But mainly because it was in the name of Kiyosaki, and I thought I would learn more about his approach to business at a seminar, and thought I could use this to grow my own online business, and I must admit that I was caught off guard and fell for the pushy sales tricks they used. The 3-day seminar I ended up buying was around $500 for 3 full days, which is not a bad price, if you will get valuable inspiration. But even though I did end up signing up for something that seemed reasonable, something did not feel right. After the free seminar I felt something was not quite right. Slowly I started to realize all the tricks they had used in the 2 hours long show, and that my guards had been down, because I trusted the name, they had used to advertise this event. I started suspecting that maybe these 3 days I bought would not be so much about actually learning something, but just to sell even more. This is a trick I already at that time had seen used very often online, were programs use a cheap price to get you in, and once you have invested a bit, they will push you to invest more, and more, and more. So I started to do some online research. And A LOT of bad reviews quickly came up. It turns out that these 3 day events seems to contain very little actual learning, and is mostly one long sales pitch for more expensive products. Already back in 2010 CBC had an article about how deceptive methods are used at the free Kiyosaki seminars, and I found several other stories confirming my suspicion. I know what these sales people were able to do in just 2 hours, so I am afraid to think about, what they can do to people in 3 days non-stop. CBC also had undercover recordings that showed how people were pushed into investing up to $45,000 at these 3-day events. CBC has previously shown undercover recordings of the sales methods used at the free seminars. An example of one of the many stories people share on the website Ripoff Report. After reading a lot of this info and thinking more about the techniques that were used at the free seminar, and how I reacted to it, it was clear to me that I had to get out and not waste my time and money going to a 3-day seminar. Luckily there was a 7-day return policy, and there were still more seminars going on in the city I lived in. So I went there and requested a refund, which they also gave me. So to be fair, I did end up getting my $500 back, and I am very glad I got out without losing any money and wasting more time – but from what I have read, there are many that have not been so lucky. So now we come to the whole reason I am sharing this long story and my experience. 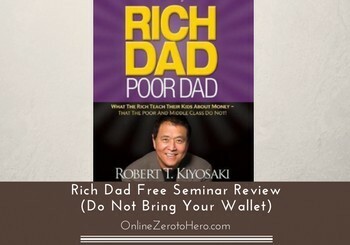 The Rich Dad Education has several free and paid seminars all over the world every week. I got out and realized what had happened, and I have not lost any money. But it is hard for me to think about all these other people that in my opinion might be lured into spending their money, because they have previously been inspired by Kiyosaki’s book. To be fair, I want to say that there was some inspiring moments at the free seminar and some valuable things to think about. And I cannot say for sure what is going on at the paid seminars, as I did not go – I can just say that from my experience and from seeing what was going on at the free seminar, I definitely do not want to go to longer events, and I definitely do not want to invest anything into their programs. So if you end up going to the free event, I just encourage you to be very careful and aware of the sales techniques used. Also, by reading this you might not be caught with your guards down, and you are able to just take in the valuable info, and not get sucked into the sales funnel. I would recommend you to stick to Robert Kiyosaki’s books and get inspiration from them, or at least be very careful, if you go to the seminars. You might find the seminars entertaining and find it interesting to see how their show is built up, now you know what to be aware of. I however want to make it clear that I cannot say you will not get anything out of going to the seminars or investing a lot of money in the training. This review is based on my experiences, and I have found out that it is definitely not an approach or method I want to spend any time or money on, and I am sharing it to make you aware of what to look out for. When you know, it might turn out it is the right way for you to go, but at least you will then do it because you choose to, and not because you feel you are being pushed. 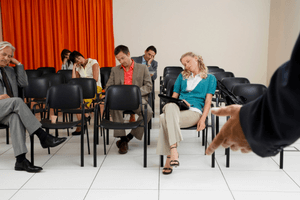 As you can see, I have not had a good experience with the Rich Dad Education free seminars. I do not like the methods they are using, and I felt manipulated after having participated. If you are interested in becoming financially free, I would recommend you to instead consider building an online income. With the right training, it is something that can be achieved by anyone, and without investing thousands of dollars (you can actually get started for free). If this sounds interesting to you, I recommend you to check out the business training platform Wealthy Affiliate, which is a platform I am a member of myself, and I have learned so much about building an online income from it. If you have any comments, any questions, or have any experience with the Rich Dad Poor Dad workshops yourself, I would love to hear from you in a comment below.